Get the best possible rates for your trip to ATD Show 2019. As you make plans to join us in San Francisco for our upcoming show, we know that estimating expenses can be a big determining factor in your decision to attend, as well as crucial in determining your dealership’s ROI for attending. Remember that ATD members enjoy exclusive discounts for travel and transportation. Hotel discounts – Save up to $200 per night off of advertised web rates using official ATD discounted rates. You can also learn information about BART (Bay Area Rapid Transit), the fast, easy, low-cost way to get to San Francisco or other nearby cities from San Francisco International Airport (SFO) and Oakland International Airport (OAK) on our NADA Show Travel & Transporation web page. 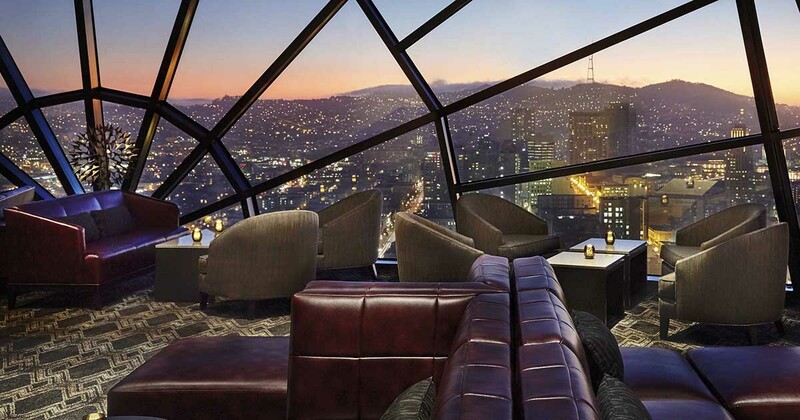 The View Lounge at Marriott Marquis San Francisco. Photo via Marriott. Most show events will take place at Marriott Marquis San Francisco, our official ATD Show 2019 headquarters hotel, unless otherwise indicated. ATD Show negotiated hotel discounts can save you up to $200 per night over advertised web hotel rates for the same dates. Take in panoramic views of San Francisco from The View, Marriott Marquis’s popular rooftop lounge, or sample the many brews and delicious food at B55 Craft House & Kitchen. Perfectly located near Union Square, San Francisco Marriott Marquis is the ideal spot to explore the City by the Bay, from the Embarcadero, to SoMa, to the Golden Gate Bridge. Famous attractions, including Fisherman’s Wharf, Haight-Ashbury and Alcatraz are within easy reach, as are museums, shopping and theaters. Learn more about how to access these special discounts on the ATD Show website. Early bird registration ends September 14. Register today!